kjis the stiffness factor and it generally varies between 0 and 12. In the same direction there is also the moment distribution factor	aj varying between 0.0 and 1.0. [*]	 NoteThe shear correction factor kz is not related to the other k stiffness factors. The stiffness assessment is required for the understanding of the Floor Diaphragmatic Behaviour that follows in §5.4. Frames could comprise either columns only, called "frame systems" or columns and walls called "dual systems". These two types of frame systems will be	considered in the following paragraphs. 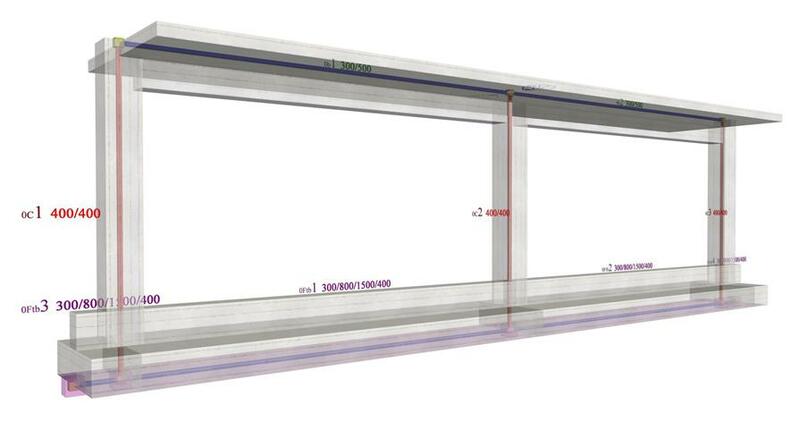 In project <B_5151a> of the related software, the cross-section of all columns is 400/400 and their height 3.0 m. The cross-section of the	flanged beams is 300/500/1300/150 and their span 6.0 m. The seismic horizontal force is equal to 50 kN. The parameter values for this modelling are identical to the corresponding ones of the example 5.1.3 except that in this case force X is equal to 50.
against 31.10·106 N/m of the fixed-ended column. Although the middle column has the same cross-section with the other ones, its stiffness is higher since two frame beams resist its bending. Project <B_5151b> derives from project <B_5151a> by adding foundation beams with cross-section 300/800/1500/400 at level -0.80 m.
against K=12·EI/h3=12·(32.8·109·Ν/m)2·(21.33·10-4m4)/(3.803·m3)=15.30·106 N/m of the fixed-ended column, which in this case has height 3.80 m.
The foundation nodes are placed close to the ground since, besides the members modelling columns and the foundation beams, another "member" also exists	modelling the soil. Special importance should be attached to this "member". 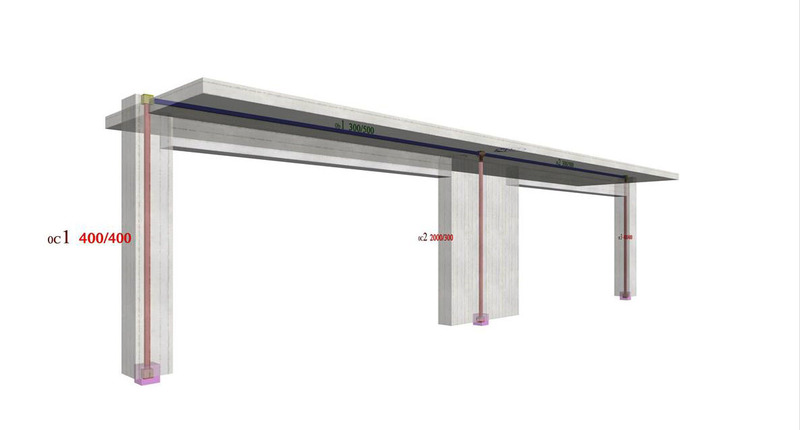 The differences in column stiffnesses are mainly due to their different	mixed height. The mixed column height is equal to the free height of the foundation floor increased by the excavation depth. The excavation depth is	usually equal to the foundation height. This analysis has been carried-out considering an average soil type. In case of a more elastic soil, the stiffness reduction is higher. In case individual footings without beams are used in the foundation, the stiffnesses become smaller and the displacements of the crossbars	considerably higher. A basement above the foundation results in higher stiffnesses and smaller displacements. 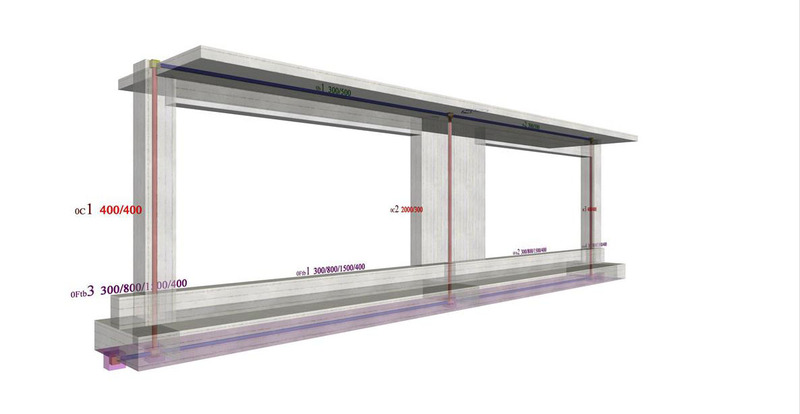 In project <B_5152a> of the related software, the structure comprises two end columns and a wall in the middle with cross-sections 400/400 and	2000/300 respectively. Their height is 3.0 m. The cross-section of the flanged beams is 300/500/1300/150 and their span is 6.0 m. The	horizontal seismic force is 50 kN. The parameter values for this modelling are the same as in the frame systems of the previous paragraph. Therefore, the wall behaves almost like one-end-fixed (with k=3.0 and a=0.0), while columns almost like fixed-ended (with	k=12 and a=0.50). If shear effect is taken into account, the crossbar displacement is δ=0.075 mm i.e. significantly higher. 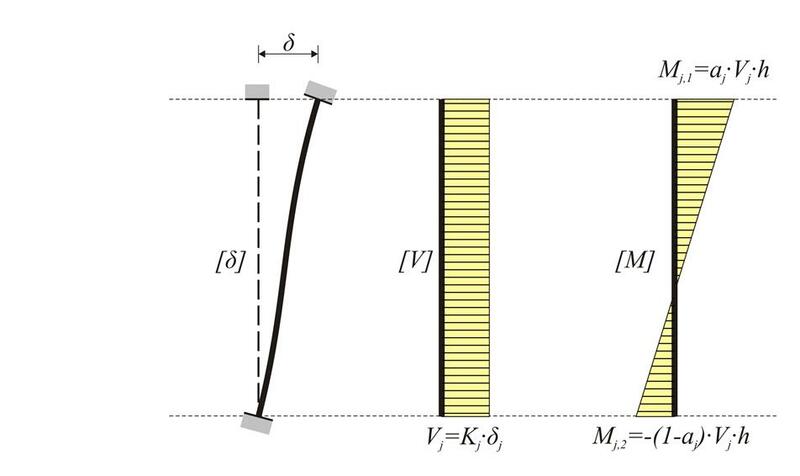 If rigid bodies are also taken into account, the crossbar displacement is δ=0.070 mm i.e. it is reduced. Project <B_5152b> derives from project <B_5152a> by adding at level -0.80 m flanged foundation beams with cross-section 300/800/1500/400. against K=12·EI/h3=12·(32.8·109·Ν/m2)·(21.33·	10-4m4)/(3.83·m3)=15.30·106 N/m of	the fixed- ended column, which in this case has a height of 3.80 m.
against K=12·EI/h3=12·(32.8	·109·Ν/m2)·(0.3·2.03	/12) m4/(3.83·m3)=1434.61·106 N/m of the	fixed- ended column. It should be noted that the foundation affects significantly the wall stiffness. The increase of the crossbar displacements is also notable. If shear	effect is taken into account, the crossbar displacement is δ=0.399 mm, i.e. slightly higher. If rigid bodies are also taken into	account, this displacement is reduced almost in half δ=0.176 mm. This analysis has been performed for an average type of soil. The stiffness reduction is higher for a more elastic soil. A basement above the foundation, results in columns with higher stiffnesses values.